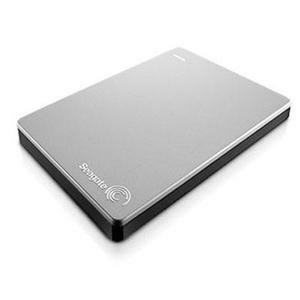 The Seagate® Backup Plus Slim portable drive for Mac® simplifies backup for consumers who want to protect their entire digital life locally, in the cloud, from mobile devices or from social networks. The slim, metal design allows you to slide the drive into your pocket, purse or backpack and carry it with you. The drive is formatted for Mac and compatible with Time Machine backup software right out of the box. Keep multiple copies of your files in case disaster strikes. Install the free Seagate Mobile Backup app on an iOS or Android mobile device to back up all of the pictures and videos from the device to the drive or the cloud. Back up mobile devices via a WiFi connection while at home, or use services like Dropbox or Google Drive while on-the-go, away from home. With the Save feature, user-generated content can be backed up from your favorite social network sites. Capture a memory, post it on a social networking site and let the Seagate Dashboard automatically back up any content posted, even photos that you are tagged in. The Share feature allows multiple files to be uploaded to social networks at once from your computer. Simply select files to upload, choose where to post them and even add comments. Managing your social profile has never been easier. Install the downloadable HFS+ driver for Windows, and use the drive interchangeably between Mac and PC computers without reformatting the drive.